I’ve liked Anna Kendrick since I first saw her in a movie. Do you think I can remember which movie that was? Nope. I can’t. I’ve watched her movies over and over again so many times that they all blend together. Celebrity memoirs are always intriguing to me, especially when they have a humorous spin. It’s fun to get to know the famous people that we see every time we walk through the checkout line at the grocery store. Especially when we get to know them from them and not from random, creepy tabloids. That’s another reason why I like to read these types of books as audiobooks narrated by the authors. Anna Kendrick is hilarious as always, sarcastic as always, and brutally honest about her journey from child actress to where she is today. This book is random and yet all ties together somehow. It’s weird. It dives down strange, dark alleyways. And it jumps up and makes you laugh out loud. 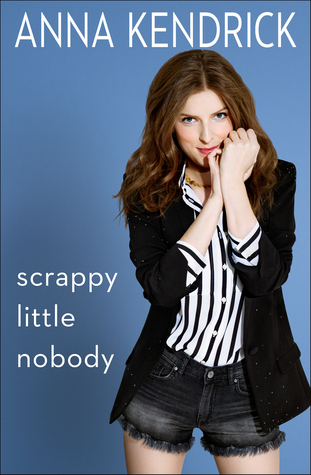 The audiobook narrated by Anna Kendrick infuses the text with her trademark sarcastic tone of voice, making the stories she tells that much funnier, weirder, and even more honest. As usual, Anna does a phenomenal job adding her voice to the script. Which, let’s be honest, she should be a master at since she wrote this script. Scrappy Little Nobody is a funny read and, at times, a little shocking. Anna’s even weirder than we thought, and it makes me like her all the more.